I’m having a hard time understanding what stroboscopic effect is. Is it something that is present on all displays lcd crt plasma etc and is unavoidable until 1000hz? Is it the judder or stutter that is present on 24p or 30fps content on a 60hz display? Is there a certain display that won’t have stroboscopic effect? Or is stroboscopic effect only visible under controlled circumstances that wouldn’t be visible under regular viewing? Hz doesn't play much of a role. Higher hz can only reduce the effect, but it's not possible to eliminate it. The faster an object moves on the screen, the more severe the effect becomes. Move your mouse cursor on the screen very fast, but don't follow it with your eyes. You'll see the mouse pointer jump between positions, with large gaps between each step. The faster you move the mouse, the larger the gaps. That's the stroboscopic effect. The higher the refresh rate, the faster you need to move the mouse to see the effect. But no matter how much higher you make the refresh rate of the display, you can always move the mouse faster and make the effect appear again. Here's a photograph of the common stroboscopic effect. Still visible even in my 480Hz monitor tests. That's the stroboscopic effect, also otherwise known as the phantom array effect. Stare in the middle of your screen while you move the mouse arrow around. Or go to http://www.testufo.com/mousearrow ... You'll easily see the stroboscopic effect / phantom array effect. The stroboscopic effect happens in games, e.g. staring at crosshairs and seeing the game motion step-step-step past your vision. Especially visible in things like tiny white elements (e.g. lamps) on dark background, scrolling past while you're turning. (C) Both, e.g. increasing refresh rate and frame rate to 240Hz, then adding a minor 1/240sec of GPU motion blur. 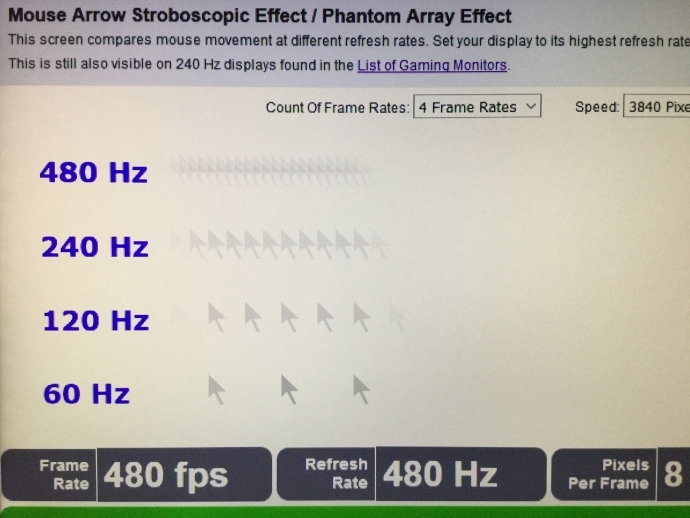 Stroboscopic effect doesn't even completely disappear on at 1000fps on a 1000Hz display. 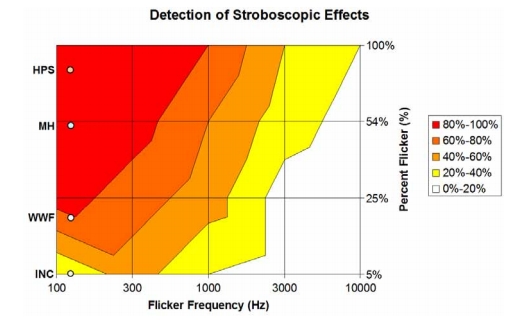 The sweet spot is roughly 10 kilohertz or beyond, after which stroboscopic effects start to become undetectable. 1000Hz is not enough (alone) to completely fix the stroboscopic stepping effect. Even so, mouse pointers may move more than 10,000 pixels per second in a fast swipe, you'd need a refresh cycle per mouse pixel step. So if you hate this effect, your only option is to add GPU motion blur effects (found in many games). It is not yet possible to have-cake-and-eat-too.